I am a professional artist with a background in technical drafting. 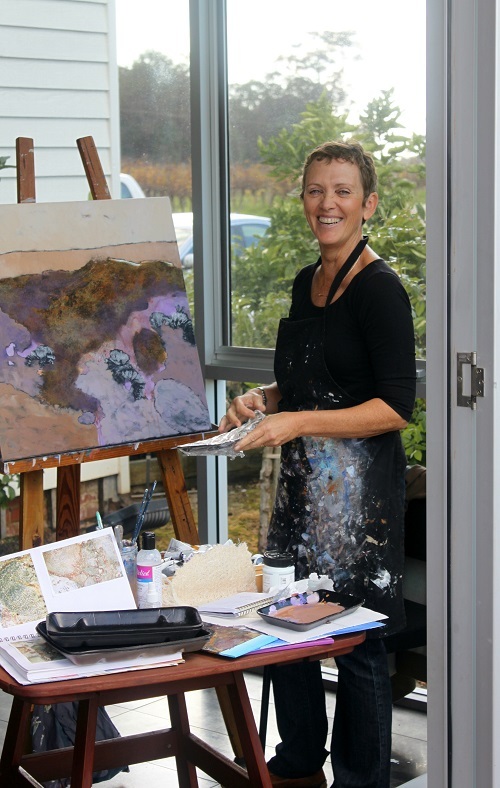 Since completing an Art & Design course at Carine Tafe, I have participated in solo and group exhibitions over many years and am resident artist at Clarke's of North Beach restaurant. My love of seascapes, the individuality of life forms with the strength, beauty and diversity of the north west of Western Australia ensures the constant evolution and passion in my paintings. This makes the hours spent at my easel a joyous and fulfilling endeavour. I work in acrylic, using moulding paste and collage of handmade papers to give texture and a tactile quality. This is a liberating process after my drafting background. I strive to create "feeling" in my paintings, getting up close and personal with, and looking beyond and into the subject matter, using the effects of light to portray the beauty, softness and strengths in usual things. I run texture and collage workshops from my studio in North Beach, and I am also involved with teaching art to persons with various disabilities which is immensely rewarding and inspiring. I have been fortunate to travel both overseas and up to our wonderful Pilbara and the Kimberley. This combined with living on the coast for most of my life gives me endless inspiration.